A beautiful canvas project inspired by one of the most intriguing of shelled creatures. It was a stroke of unbelievable luck when my husband, a 5 year old at the time, found a perfectly intact paper nautilus shell on the beach. He was so proud of it that he brought the fragile shell into show-and-tell, only to his devastation to have it be mistakenly broken. To this day he pines over it, still marveling at the memory of the precious relic and regretful about bringing it to school. I have thought a few times to try and find one to purchase to replace it, but not wanting to encourage the decline of this rare species, I thought perhaps a piece of handmade art might somewhat fill the void? So, here’s what I attempted! 2. Trace the cut-out nautilus onto tissue paper and cut around the edges. I stacked mine so that I would be able to get a few copies in case one tore. 4. 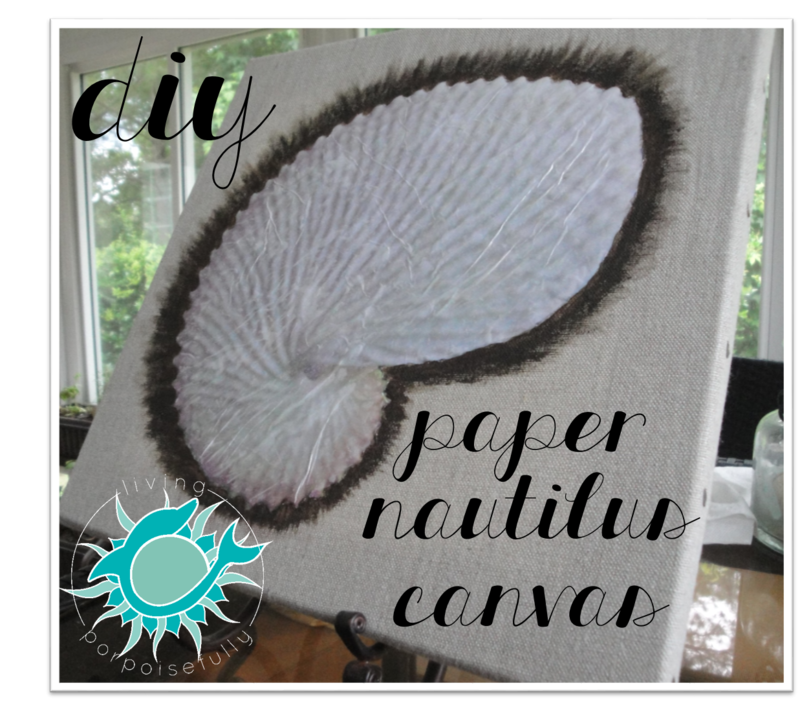 Lay a tissue paper nautilus down on top of the freshly Mod Podged version and paint more Mod Podge over it. It will wrinkle and add texture. Be careful, as the tissue paper can tear easily when coated in Mod Podge! 5. Paint some pearlizing medium on the Mod Podged tissue paper to give it a nice iridescent sheen. I dispensed it right on the paper and then spread it evenly with my brush. You’re welcome! I’d love to know how it turns out if you try it. You are very lucky to have found a nautilus on the beach – they are indeed fragile but well-built for their purpose. What a treasure!